Objective: To better understand the mechanisms of autoantibodies to the axonal protein contactin-associated protein-like 2 (Caspr2) by studying their target epitopes. Methods: A plasmid for expressing Caspr2 was modified so that the various extracellular subdomains were deleted individually and in groups. Cultured cells were transfected to express these constructs and assayed by immunofluorescence staining with a commercial Caspr2 antibody and a panel of patient sera known to react with Caspr2. Western blotting was also performed. The role of glycosylation in immunogenicity was tested with tunicamycin and PNGase F treatment. Results: Patient antibodies bound to the extracellular domain of Caspr2. Neither native protein structure nor glycosylation was required for immunoreactivity. 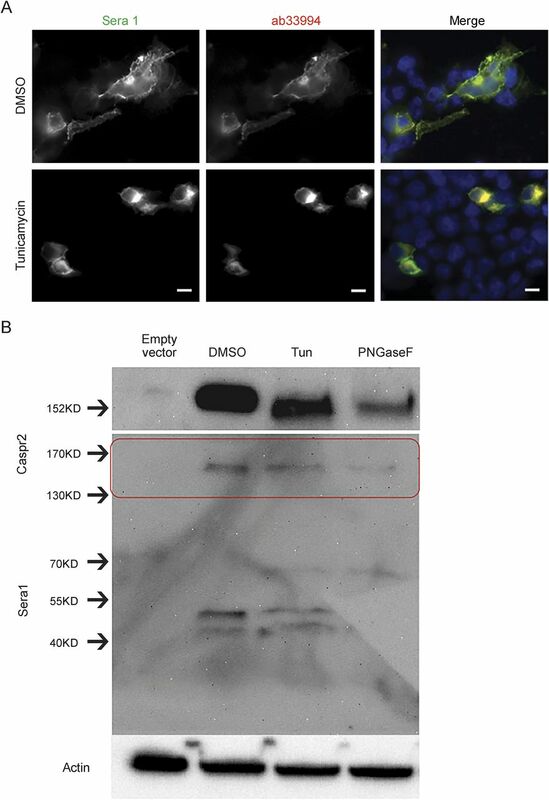 Caspr2 constructs with single or multidomain deletions were expressed on the plasma membrane. All deletion constructs were recognized by patients' sera, although reactivity was significantly reduced with deletion of the discoidin-like subdomain and strongly reduced or abolished with larger deletions of multiple N-terminal subdomains. Caspr2 with all subdomains deleted except the discoidin-like domain was still recognized by the antibodies. Conclusion: Caspr2 autoantibodies recognize multiple target epitopes in the extracellular domain of Caspr2, including one in the discoidin-like domain. Reactivity for some epitopes is not dependent on glycosylation or native protein structure. Caspr2 has a large extracellular domain with 8 distinct subdomains and 12 potential N-linked glycosylation sites. It is not clear what the functions of these subdomains are or how the autoantibodies may affect the function of Caspr2 or its interactions with other JPN proteins. Autoantibodies to synaptic proteins, including the NMDA receptor (NMDAR) and the nicotinic acetylcholine receptor (nAChR), may target either a single dominant epitope or a major immunogenic region.12,–,14 For NMDAR and nAChR antibodies 3-dimensional structure is very important, but other autoantibodies, such as to glutamic acid decarboxylase 65 (GAD65), recognize linear epitopes under denatured conditions (e.g., on Western blot). We have therefore attempted to find a single dominant epitope for Caspr2 antibodies and to determine whether the autoantibodies require intact tertiary structure and/or protein glycosylation. Serum and CSF were collected with informed consent from patients with clinical features of Caspr2 autoimmunity (encephalitis and/or peripheral nerve hyperexcitability) under a tissue bank protocol approved by an institutional review board (IRB) at the University of Pennsylvania. A separate protocol approved by the University of Pennsylvania IRB was used to access the samples from the tissue bank for testing and to access the clinical information. Samples from patients found to contain Caspr2 antibodies using methods previously described7 were selected for further studies. The clinical characteristics of 8 of these patients have been published previously: 2 had encephalitis only, 1 had acquired peripheral nerve hyperexcitability only, and 5 had both encephalitis and peripheral nerve hyperexcitability.7 In addition, we studied samples from 2 additional patients who were subsequently identified: 1 with neuromyotonia only and 1 with both neuromyotonia and encephalitis. The number of patient samples included for the experiments was limited by the amount of sera available for testing. All experiments in this manuscript used a minimum of 4 patient samples to confirm results. Creation of plasmids for expressing Caspr2 mutants. Complementary DNA (cDNA) encoding full-length human Caspr2 in a Prk5 vector was obtained (gift from Dr. Elior Peles, Weizmann Institute of Science, Rehovot, Israel). This cDNA was used as a template for deleting individual subdomains of Caspr2 using the Quikchange XL Site-Directed Mutagenesis Kit (Stratagene, Santa Clara, CA) with modifications described previously,15 following an approach used previously to study NMDAR antibodies.12 Primers for the various mutations were selected to include 27 bases before the cut site and 18 bases after the cut site on average for both the forward and reverse primers; these primers are listed in table e-1 at Neurology.org/nn. Clones were selected using standard microbiology techniques, and plasmid DNA was purified using QiaPrep spin miniprep and maxiprep kits (Qiagen, Venlo, the Netherlands). Clones were screened by sequencing across the area with the target excision to determine which contained the desired deletions; clones with successful deletions were verified to contain no unintended mutations by full-length sequencing. Plasmid DNA concentrations was determined on a Nanodrop spectrophotometer (Thermo Scientific, Waltham, MA). HEK293 T cells were grown on poly-d-lysine–coated coverslips in MEM with 5% FBS and 1% P/S and were transiently transfected with full-length Caspr2 or Caspr2 mutants using JetPrime reagent (Polyplus Transfection, Illkirch, France), per the manufacturer's instructions. Cells were assayed 24–48 hours posttransfection. Cells were fixed in 4% paraformaldehyde for 10 minutes, permeabilized with 0.1% PBS-tween or 0.3% triton X-100 for 15 minutes, and blocked in 0.3 M glycine with 10% normal goat serum and 5% BSA for 1 hour at room temperature. Cells were singly or doubly stained with a commercial anti-Caspr2 primary antibody (ab33994, Abcam, Cambridge, United Kingdom) diluted at 1:200 and patient sera diluted 1:1,000 in blocking buffer overnight at 4°C. 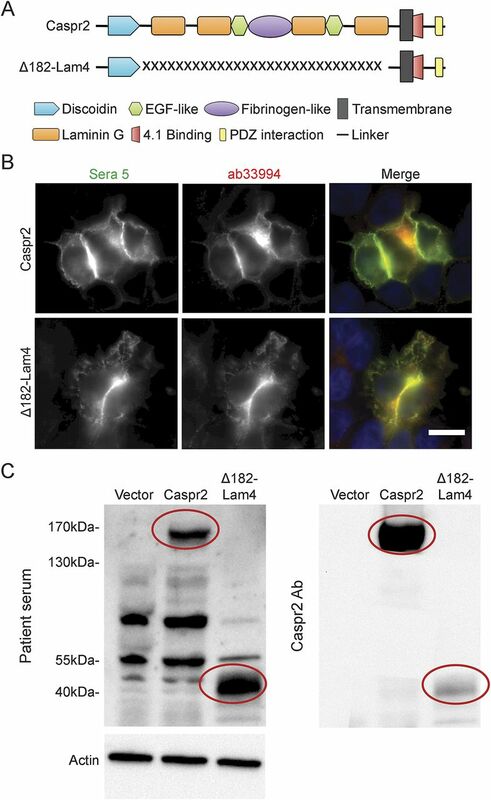 (ab33994 targets the intracellular domain of Caspr2 and would not be expected to compete with the human autoantibodies, which target the extracellular domain. The intracellular domain was also not modified in any of the deletion constructs.) Coverslips were washed with PBS and then secondary antibodies (Alexa Fluor 488–conjugated donkey anti-human IgG and TRITC-conjugated donkey anti-rabbit IgG at 1:400) were applied for 1 hour at room temperature. Slides were mounted in Fluoromount-G with DAPI (SouthernBiotech, Birmingham, AL) and visualized on a Leica DMRBE fluorescent microscope. Pictures were captured with a Leica DFC-350F digital camera and Openlab software (Improvision, Coventry, United Kingdom). Quantification of fluorescence was performed using NIH Image J and Adobe Photoshop software. Untransfected cells and cells in which only the secondary antibody was applied served as negative controls. Each experiment contained a minimum of 2 technical replicates per condition, and experiments were repeated a minimum of 3 times. Quantification of fluorescence was performed using NIH Image J and Adobe Photoshop software. The intensity of staining of each single domain deletion construct by patients' sera was normalized by the amount of staining with the commercial antibody channel. A ratio was obtained for each construct. HEK293 T cells were cultured and transfected as described above. At 4 hours posttransfection, growth media were replaced with media containing 0.2 μg/mL tunicamycin (Sigma-Aldrich, St. Louis, MO) or DMSO vehicle control. Cells were harvested 24–48 hours later and assayed as described above. HEK293 T cells were transfected as above and lysed on ice in RIPA buffer (50 mM Tris pH 7.2, 150 mM NaCl, 0.1% SDS, 0.5% Na deoxycholate, 1% triton X-100, 2 mM EDTA) supplemented with complete protease inhibitor tablet (Roche, Basel, Switzerland). Lysates were centrifuged at 10,000 rpm for 10 minutes. Protein concentration in the supernatant was measured using Pierce BCA assay (Thermo Scientific) on a plate reader. The supernatant was diluted in sample buffer (Bio-Rad, Hercules, CA) and heated to 100°C for 5 minutes. Samples were run on a Bio-Rad electrophoresis system on 4%–20% gels, transferred to PDVF membrane, blocked in 5% milk for 1 hour, and incubated in a commercial anti-Caspr2 antibody (ab33994, Abcam) diluted 1:1,000 or patient sample overnight diluted 1:1,000 at 4°C. Secondary antibodies were alkaline phosphatase–conjugated donkey anti-human or anti-rabbit applied for 1 hour at room temperature at 1:10,000. Blots were developed using Tropix CDP-Star reagent (Applied Biosystems, Waltham, MA) and visualized on a Chemi-Doc imaging system (Bio-Rad). Whole cell lysates from Caspr2-transfected or untransfected control HEK293 T cells were diluted in denaturing buffer and incubated at 100°C for 10 minutes, after which G7 reaction buffer, 10% NP40, and PNGase F (New England Biolabs, Ipswich, MA) were added per the manufacturer's instructions and incubated for 1 hour at 37°C. The samples were then prepared similarly to other lysates for Western blotting. Caspr2 autoantibodies consistently recognize an extracellular epitope of Caspr2. We studied a panel of 10 sera from patients with Caspr2 antibodies identified using methods previously described.7 In order to confirm that patients' Caspr2 antibodies consistently recognize a surface epitope of Caspr2, HEK293 T cells were transfected to express wild-type Caspr2 and immunostained live with patient sera (1:500). The cells were then fixed, permeabilized, and treated with a rabbit Caspr2 antibody targeting an intracellular epitope, followed by fluorescent anti-human and anti-rabbit secondary antibodies (4 representative cells are shown in figure 1). All 10 patients' sera recognized a surface epitope on transfected cells but not on untransfected cells. HEK293 T cells were transiently transfected to express Caspr2, stained with a series of patient sera live, and then stained with a commercial antibody to Caspr2 after permeabilization and fixation. Nuclei of transfected and untransfected cells were stained with DAPI (blue). Surface epitopes of Caspr2 were recognized by all 10 patients' sera (4 representative samples [S1–S4] are shown). Scale bar = 10 μm. Glycosylation and tertiary structure are not required for antibody recognition of Caspr2. Caspr2 has 12 potential N-linked glycosylation sites in its extracellular domain.16 In order to determine whether glycosylation of these sites is required for recognition by Caspr2 autoantibodies, we transfected cultured cells to express Caspr2 while these cells were treated with tunicamycin (figure 2). (In these experiments, human antibodies were applied after fixation and permeabilization since Caspr2 was no longer membrane-expressed.) Tunicamycin treatment prevented cell surface expression of Caspr2 and resulted in a shift of the Caspr2 band on Western blot, but it did not prevent antibody recognition. Protein extract from cells transfected to express Caspr2 was also deglycosylated with PNGase F, resulting in a shift in the band on Western blot (figure 2B). This method of deglycosylation likewise did not prevent recognition of Caspr2 by the autoantibodies, even in the denatured state (i.e., on the Western blot). We further tested a panel of 6 sera for the ability to recognize Caspr2 under denaturing conditions (on Western blot), and all samples were able to do so (figure e-1). Caspr2 autoantibodies therefore recognize the protein under denaturing conditions and glycosylation is not required for antibody recognition. (A) Cells were transfected to express Caspr2 in the presence of tunicamycin or vehicle (DMSO). 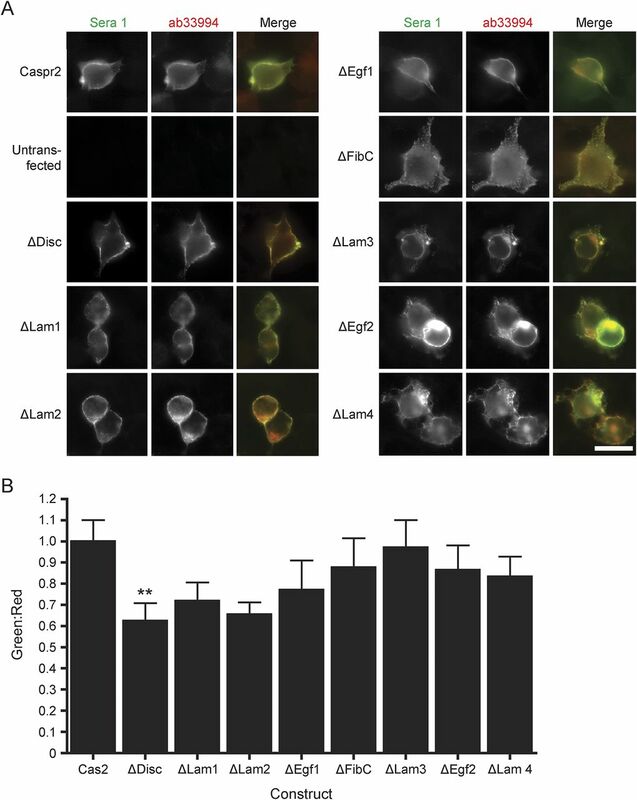 Tunicamycin treatment resulted in intracellular localization of Caspr2, but the transfected cells were still recognized by patients' sera and a commercial antibody to Caspr2 (ab33994). Scale bar = 10 μm. (B) Lysates from cells transfected with empty vector, cells transfected with Caspr2 treated with vehicle (DMSO), Caspr2 cells treated with tunicamycin (Tun), and Caspr2 lysates treated with PNGase F were probed on Western blot with a commercial Caspr2 antibody and patient sera. Deletion of single Caspr2 subdomains does not entirely eliminate reactivity. Caspr2 has a very large extracellular domain, comprising more than 1,200 amino acids. The extracellular domain has previously been subdivided into 8 regions based on homology to various protein domains. We have followed a previously proposed definition of these domains (http://www.uniprot.org/uniprot/Q9UHC6#section_seq). 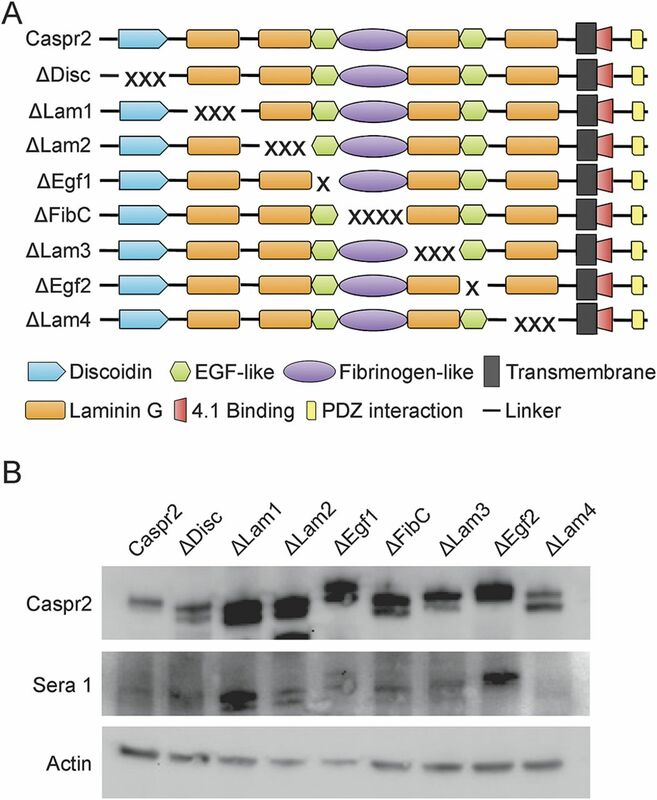 Starting from the N-terminus of the protein and moving to the transmembrane region, these domains are Discoidin (Disc), LamininG (Lam1), LamininG (Lam2), Egf (Egf1), FibrinogenC (FibC), LamininG (Lam3), Egf (Egf2), and LamininG (Lam4). There is a single transmembrane domain and a relatively small intracellular region with a protein 4.1-binding domain. 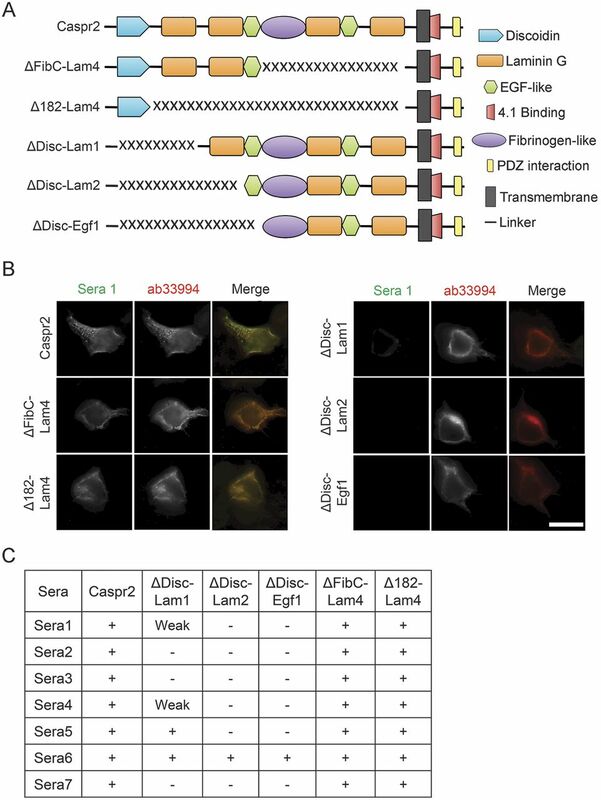 We generated a series of plasmids for expressing Caspr2 with deletions of each of the 8 extracellular subdomains (figure 3A). We named these constructs with a delta symbol followed by the domain deleted. ΔDisc, for instance, has the Disc domain deleted. (A) Single-domain deletion constructs were generated as shown. (B) Each of these constructs was recognized by patients' sera on Western blot probed with a commercial antibody to Caspr2 (Caspr2) and patients' sera (sera 1). The single subdomain deletion constructs were all expressed when transfected into cultured HEK293 T cells. It is interesting that patients' sera reacted with each of these constructs on Western blot (figure 3B) and also by immunofluorescence (figure 4). All 10 tested patient sera were able to immunostain living cells expressing each of these single-domain deletion constructs, confirming that they were all expressed on the cell membrane (figure 4). This pattern of findings showed that no single extracellular subdomain was absolutely necessary for antibody recognition and that multiple epitopes must exist in the extracellular domain. (A) Cultured cells were transfected to express wild-type and single-domain deletion constructs. All constructs were expressed on the cell membrane and all were recognized by a panel of patients' sera. Scale bar = 10 μm. (B) The relative staining in the human and commercial channels was quantified for the various deletion constructs. Only ΔDisc differed significantly from full-length Caspr2 using this method. The relative intensity of immunostaining of some constructs, particularly ΔDisc, was decreased by eye for all patients studied. 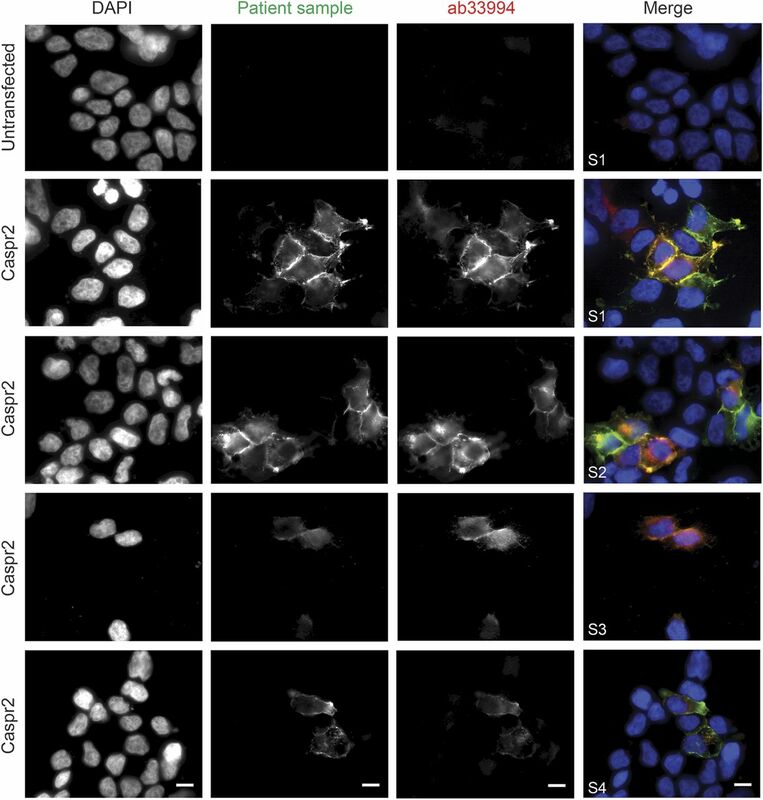 This finding is quantified in figure 4B, where the relative intensity of staining with the human and commercial antibodies is compared for each of the single-domain deletion constructs. Using this method, only ΔDisc showed significant reduction in staining with the human antibodies compared to full-length Caspr2. These results suggest that the Disc domain may contain a target epitope. The Disc domain is a common epitope for patients with Caspr2 antibodies. In order to more definitively determine whether the Disc domain is sufficient for antibody recognition, a construct with only the Disc domain, the transmembrane domain, and the intracellular domain was generated (figure 5A). This construct was recognized by 9 of 10 serum samples (figure 5B). The Disc domain alone is therefore sufficient for recognition by the majority of tested patients. However, deletion of this single Disc domain (ΔDisc) did not prevent recognition by any of our samples, suggesting that another epitope (or potentially multiple other epitopes) outside the Disc domain exists. This experiment was repeated 4 times, and all experiments suggested decreased intensity of but not absence of immunostaining with deletion of the Disc domain compared to the wild type (figure 4B). Thus, there is a discrete epitope within the Disc domain that is sufficient but not necessary for reactivity. (A) A construct (Δ182-Lam4) with all extracellular subdomains except the Disc domain was created. (B) This construct was recognized by 9 of 10 sera in transfected cells. Scale bar = 10 μm. (C) Western blot of lysates from cells transfected with an empty vector, wild-type Caspr2, or the Δ182-Lam4 construct were probed with human sera and then reprobed with a rabbit antibody to Caspr2. The Δ182-Lam4 protein is significantly smaller than wild-type Caspr2 but is still recognized by both human and rabbit antibodies. Patients' sera also recognized the construct containing only the Disc domain (with all other extracellular subdomains deleted) on Western blot, suggesting that an epitope in the Disc domain is still recognized under denaturing conditions (figure 5C). Taken together with the ability of patients' sera to recognize ΔDisc on Western blot (figure 3B), it appears likely that there are multiple epitopes in the Disc domain and elsewhere that are not dependent on tertiary structure. Other target epitopes are generally in the N-terminal half of Caspr2. In order to determine which other subdomains (aside from Disc) might contain target epitopes, we constructed a new series of deletion constructs involving multiple domains of Caspr2 (figure 6A). In the case of constructs with a large deletion of the C-terminal domain of the protein, we could confirm that these constructs were expressed on the cell membrane by immunostaining live cells with patient sera (figure 6B). Although constructs with larger deletions of the N-terminal half of the protein were not recognized by most patients' sera (in live or fixed/permeabilized cells), these constructs also appeared to be expressed on the membrane (figure 6B). Testing with a panel of 7 sera showed that target epitopes for most patients (6 of 7) were confined entirely to the 4 subdomains on the N-terminal of the protein. Only 1 of 7 samples reacted (weakly) when these 4 subdomains were deleted (figure 6C). Taken together, these results suggest that most target epitopes are concentrated within the N-terminal half of the extracellular domain and that patients' sera only rarely target any epitope within the C-terminal half of the extracellular domain. (A) Multidomain deletion constructs of Caspr2 were generated to determine which domains contain target epitopes. (B) These constructs were transfected into cultured cells and immunostained with patient sera and a rabbit antibody to Caspr2 (ab33994). Scale bar = 10 μm. (C) The results for 7 patient sera are shown. See text for discussion. These studies have shown that autoantibodies to Caspr2 target multiple epitopes on the extracellular domain of the protein. The large extracellular domain of Caspr2 may make it a particularly available target for autoimmunity compared with the other members of the VGKC complex. A major epitope is within the discoidin-like domain, and other epitopes appear to be concentrated within the N-terminal half of the protein. At least some of these epitopes are not dependent on tertiary structure (i.e., can be recognized on Western blot) and are not glycosylation-dependent. Since our single-domain deletions (including ΔDisc) were recognized on Western blot, it is likely that for most samples more than one epitope is not dependent on tertiary structure. Other autoantibodies to neuronal surface epitopes target a range of ionotropic neurotransmitter receptors (NMDAR, AMPAR, glycine receptor, nAchR) or metabotropic neurotransmitter receptors (GABA-B-R, mGluR1, mGluR5). In the case of antibodies to the NMDAR and AMPAR, the antibodies cause cross-linking and internalization of the receptor and thus result in decreased receptor function.17,–,19 Since Caspr2 is a cell adhesion molecule and not a receptor, different autoimmune mechanisms must be considered, for example disruption of the interaction of Caspr2 with TAG-1, disruption of the ability of Caspr2 to cluster VGKCs, or internalization of Caspr2 (with or without associated VGKCs). Understanding the target epitope of the antibodies is a first step in examining these possibilities rigorously. The extracellular domain of Caspr2 is known to interact with TAG-1 in cis (expressed on the axon) and in trans (expressed on myelinating cells apposed to the axon).20,21 It is known that the immunoglobulin-like domain of TAG-1 binds to the extracellular domain of Caspr2,22 but it is not known which subdomain(s) of Caspr2 are required for these interactions. Furthermore, it is not known whether the same area of Caspr2 is required for the cis and the trans interaction. One plausible explanation for the multiple epitopes identified is that some antibodies disrupt the interaction between Caspr2 and TAG-1 in cis, whereas others disrupt the interaction between Caspr2 in trans. Future studies will be needed to determine whether the antibodies affect the interaction between Caspr2 and TAG-1. Since the interaction between these 2 proteins is critical for the proper localization of potassium channels,8 this would be a plausible disease mechanism. Abby L. Olsen: drafting/revising the manuscript, study concept or design, analysis or interpretation of data, acquisition of data. Yongjie Lai: analysis or interpretation of data, acquisition of data. Josep Dalmau: drafting/revising the manuscript, contribution of vital reagents/tools/patients. Steven S. Scherer: drafting/revising the manuscript, study concept or design, analysis or interpretation of data. Eric Lancaster: drafting/revising the manuscript, study concept or design, analysis or interpretation of data, acquisition of data, statistical analysis, study supervision, obtaining funding. This work was supported by K08 NS075142 to E.L. E.L. was also supported by a grant from the Dana Foundation. A.L. Olsen and Y. Lai report no disclosures. J. Dalmau is the editor of Neurology: Neuroimmunology & Neuroinflammation; is on the editorial board for Neurology UpToDate; holds patents for and receives royalties from autoantibody test, NMDA receptor autoantibody test; has patents pending for GABA(B) receptor autoantibody test, GABA(A) receptor autoantibody test, DPPX autoantibody test, and IgLON5 autoantibody test; has consulted for Advance Medical; and received research support from Euroimmun, NIH, NIMH, Instituto Carlos III, and AGUR. S.S. Scherer is on the scientific advisory board for the Charcot-Marie-Tooth Association; is on the editorial board for Cell and Tissue Research, Experimental Neurology, Glia, Journal of Neuroscience Research, and Journal of the Peripheral Nervous System; has consulted for Lundbeck, Scisive, Clarion Consulting, Pfizer, Guidepoint Global Advisors, Cydan, and Grifols; and received research support from NIH/National Institute of Neurological Disorders and Stroke. E. Lancaster received speaker honoraria from Grifols Inc; has consulted for Medimmune Inc; provided expert review for the Federal Vaccine Injury Compensation Program; and received research support from Talecris Inc, Lundbeck Inc, National Institute of Neurological Disorders and Stroke, and Dana Foundation. Go to Neurology.org/nn for full disclosure forms. The authors thank Drs. Elior Peles (Weizmann Institute, Rehovot, Isreal), Domna Karagogeos (University of Crete Medical School, Heraklion, Crete, Greece), and Catherine Faivre-Sarrailh (Université de la Méditerranée Aix-Marseille II, Marseille, France) for sharing plasmid constructs related to Caspr2 used in some preliminary studies. The authors also thank the patients and their families for supporting this research by donating biological samples. Accepted in final form May 22, 2015.
. Acquired neuromyotonia: evidence for autoantibodies directed against K+ channels of peripheral nerves. Ann Neurol 1995;38:714–722.
. Autoantibodies detected to expressed K+ channels are implicated in neuromyotonia. Ann Neurol 1997;41:238–246.
. Neuromyotonia and limbic encephalitis sera target mature Shaker-type K+ channels: subunit specificity correlates with clinical manifestations. Brain 2006;129:1570–1584.
. Investigations of caspr2, an autoantigen of encephalitis and neuromyotonia. Ann Neurol 2011;69:303–311.
. Multiple molecular interactions determine the clustering of Caspr2 and Kv1 channels in myelinated axons. J Neurosci 2008;28:14213–14222.
. Association of TAG-1 with Caspr2 is essential for the molecular organization of juxtaparanodal regions of myelinated fibers. J Cell Biol 2003;162:1161–1172.
. Clustering and activity tuning of Kv1 channels in myelinated hippocampal axons. J Biol Chem 2011;286:25835–25847.
. Determinants of excitability at transition zones in Kv1.1-deficient myelinated nerves. J Neurosci 1999;19:5768–5781.
. Anti-NMDA receptor encephalitis antibody binding is dependent on amino acid identity of a small region within the GluN1 amino terminal domain. J Neurosci 2012;32:11082–11094.
. Analysis of GAD65 autoantibodies in Stiff-Person syndrome patients. J Immunol 2005;175:7755–7762.
. Myasthenia gravis and the tops and bottoms of AChRs: antigenic structure of the MIR and specific immunosuppression of EAMG using AChR cytoplasmic domains. Ann N Y Acad Sci 2008;1132:29–41.
. Generation of deletion and point mutations with one primer in a single cloning step. Biotechniques 2000;29:970–972.
. Caspr2, a new member of the neurexin superfamily, is localized at the juxtaparanodes of myelinated axons and associates with K+ channels. Neuron 1999;24:1037–1047.
. AMPA receptor antibodies in limbic encephalitis alter synaptic receptor location. Ann Neurol 2009;65:424–434.
. Structural requirement of TAG-1 for retinal ganglion cell axons and myelin in the mouse optic nerve. J Neurosci 2008;28:7624–7636.
. The expression of TAG-1 in glial cells is sufficient for the formation of the juxtaparanodal complex and the phenotypic rescue of tag-1 homozygous mutants in the CNS. J Neurosci 2010;30:13943–13954.
. Structure-function analysis of protein complexes involved in the molecular architecture of juxtaparanodal regions of myelinated fibers. Biotechnol J 2007;2:577–583.
. Myasthenogenicity of the main immunogenic region. Ann N Y Acad Sci 2012;1274:9–13.
. Antigen-specific immunotherapeutic vaccine for experimental autoimmune myasthenia gravis. J Immunol 2014;193:5044–5055.